Mix the flour and salt in a bowl. Add water, a little at a time, kneading the flour until the dough comes together in a ball. Pull off a lemon-size piece of the dough. 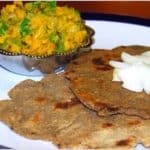 Sprinkle the rolling surface liberally with all-purpose or wheat flour and roll out the bhakri carefully into a circle about 4-5 inches in diameter. These bhakris are extremely difficult to roll, so it might take some time to get it right. I sometimes substitute half the millet flour with regular whole-wheat flour which makes them easier to roll. Heat a cast-iron or other griddle. Place the bhakri on it and leave alone until the surface starts to turn opaque. Flip over. Smear a little oil over the bhakri. Cook both sides until golden-brown spots appear. Serve hot with the zunka, and some raw, chopped onions.